Media RSS is a new RSS module that supplements the capabilities of RSS 2.0. RSS enclosures are already being used to syndicate audio files and images. Media RSS extends enclosures to handle other media types, such as short films or TV, as well as provide more metadata with the media. Media RSS enables content publishers and bloggers to syndicate multimedia content such as TV and video clips, movies, images and audio. 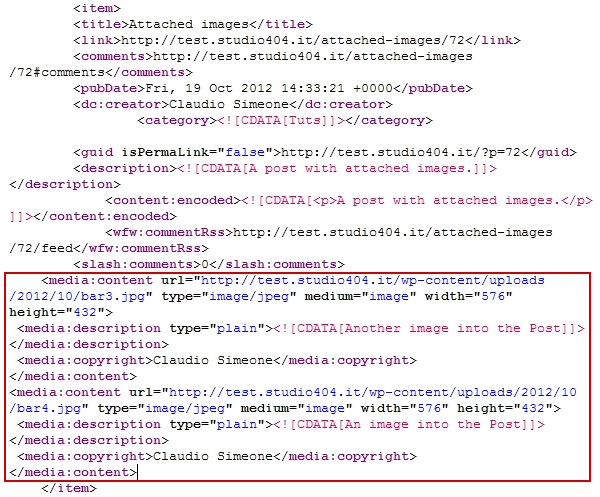 This WordPress RSS Media Feed contribution inserts these fields within the WordPress RSS 2 Outline. Initial attempt to enhance WordPress RSS Media feed to RSS 2 specifications.